24-year-old Ella Mai commanded our attention with her hit single "Boo'd Up" and the one thing that you cannot ignore about the talented superstar is her flawless skin. She seems to be a minimalist when it comes to her look, which is much appreciated, as it allows for her natural beauty to shine through. Ella partnered up with Vogue Magazine to share details about her morning routine, which is quite unique since she has sensitive skin like many of us. Ella begins her routine with one of the most underrated ingredients in any beauty routine: water. She makes sure to draw it at a temperature that is not too hot, and not too cold, in order for her facial cleansing to be as soothing as possible, and to open up her pores. "I don't use much as you can see. I have sensitive skin, [so] I've always had to make sure I don't use anything that makes me break out or makes me get rashes or anything so I've kind of had to be into skincare. Otherwise, I'd be walking around like Rudolph the Red-Nosed Reindeer." When it comes to sensitive skin, over time you will learn that less is more! The more focus that you put into products with more natural ingredients, opposed to ones that are loaded with chemicals, the more you will ensure that your skincare regimen revolves around soothing your skin instead of inflaming it. "I drink a lot of water. For ages I cut out juice, I don't drink any fizzy drinks…you will always see me with a bottle of water in my hand and I think that has a lot to do with having clean skin. It's obviously genetics as well, thank you, mom, I love you!" "I'll always have this in my pocket. You'll never ever catch me without it in my pocket." "I hardly ever use a hair dryer [and try to] keep heat out of my routine because when I was younger, I straightened my hair a lot, and blow dried it a lot, and dyed it, and all the stuff that you do when you're trying to be experimental. It ruined my curl pattern. So for ages, I've tried to use no heat, let it air-dry, and just use water really." Nowadays, when she wants to spice up her looks, she lays down her baby hair to her liking and throws on her favorite lipgloss, Fenty Beauty's Gloss Bomb. 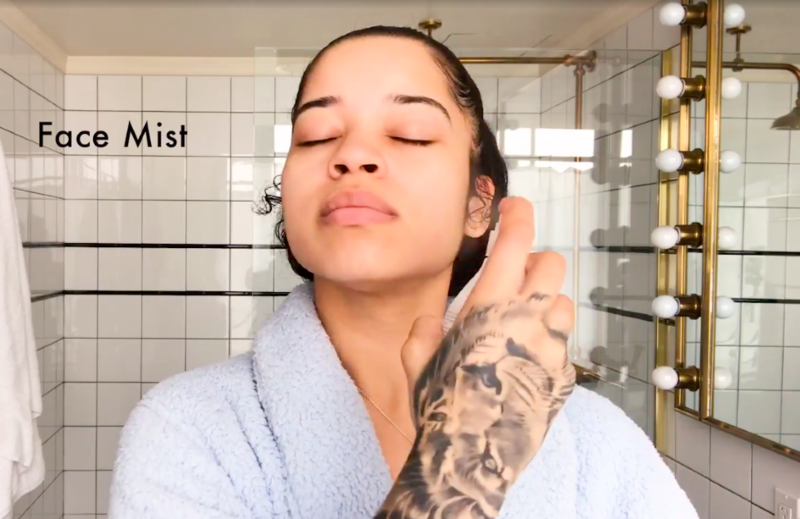 With her morning routine being no more than 5 minutes, she proves to be relatable not only in her music but in her approach to getting ready for the day! Featured image by Ella Mai.